Take a stroll along the quayside, just moments away from the St Mawes/Falmouth ferry, and discover the recently refurbished St Mawes Hotel. You’ll find a lively blend of yachting types, locals and holiday visitors all enjoying the dockside atmosphere in the centre of this charming Cornish village (a stay at the St Mawes Hotel means you can walk just about anywhere in the village). There are two dining options, both informal and inviting. Downstairs there’s a lively bar where catching up on the latest local news and gossip is a favourite pastime. Stand at the bar and chat or take a table for two or more in the informal Cornish style atmosphere. 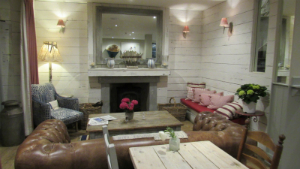 If you’re a slightly larger group and are lucky you’ll find the fireside sofa and seating particularly cosy and welcoming as you scan the daily papers and the local Western Morning News. Here you can enjoy morning coffee, afternoon tea or anything in between. Upstairs, the Cornish theme continues in an elegant but informal living room atmosphere. The food both upstairs and downstairs is equally informal and creative – wonderful seafood pizzas, Cornish crab sandwiches, jerk chicken with red pepper and fresh coriander, or perhaps the St Mawes Ploughmans to share. The mouthwatering list leads us eventually to desserts that are appropriately decadent – sticky toffee pudding with toffee sauce and clotted cream… wow! Jazz Sundays also featured from late spring until the end of September. Sit back, relax and listen to cool jazz tunes and regular live jazz as you enjoy delicious roasts and seafood dishes accompanied by a good bottle of wine or even a glass or two of champagne. On sunny days the sound of jazz on the terrace and in the street below lures passersby to join the enthusiasts inside on the first floor. And not to be overlooked is the discrete sign on the first floor marked The Hidden Cinema. 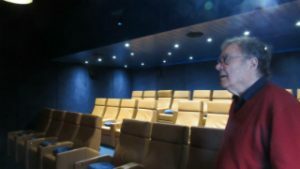 Enquire and you’ll be presented with a programme of cinema listings in the luxurious 24-seat private cinema complete with wide screen, surround sound and fully reclining leather chairs. Sit back at the press of a button and enjoy a blockbuster, a Quentin Tarantino cult movie, the Grand Prix, The Masters and much more while you snack on popcorn or ice cream or sip your favourite cocktail. There are even dine and view evenings. Private viewings can be arranged or join a small group of movie enthusiasts and be entertained in style.